The 105-mile Fife Coastal Path starts at the Burgh of Culross and winds its way along beach, rough paths, villages and towns to the Tay Bridge in the north. The walk is best completed in sections, and it’s always worth leaving time for some food experiences on the way: a top restaurant, fish and chips on the pier, browsing goodies for a picnic or watching cheese being made at a dairy farm. Culross is now preserved for the nation by The National Trust for Scotland, its 16th- and 17th-century houses a reminder of a once busy port with coal mining connections. A little to the east is the tiny village of Limekilns where historically there was a lime works as well as coal. From here you can see the magnificent Forth bridges with the Pentland hills beyond. Another few miles brings us to North Queensferry, and just up the quayside from where the original ferry crossed to the South lies our first food gem. The Wee Restaurant sits beneath the towering Victorian columns of Forth Bridge. From here the path takes us to Aberdour. Make your way to Hawkcraig Point and the Room with a View restaurant in the Forth View Hotel, where chef Tim Robson presides. 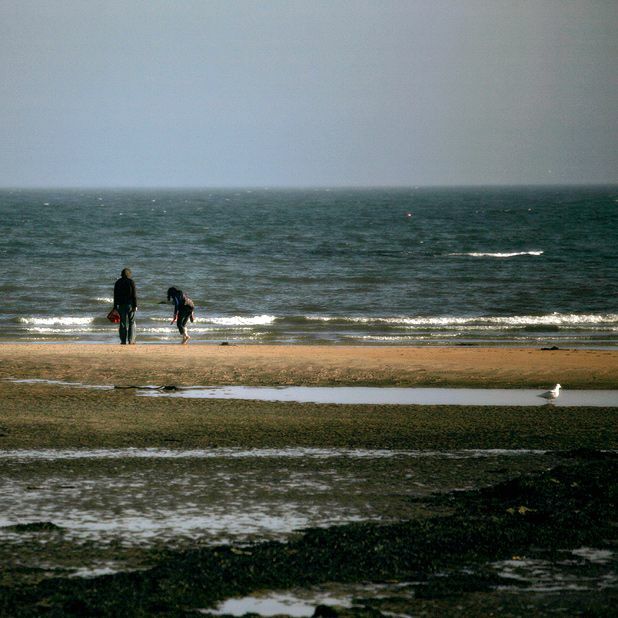 The largest town on the coastal path is Kirkcaldy with a long industrial history from coal to linoleum manufacturing. The latter is making a return along with its sweet, lingering odour. Farmers’ markets are held in the Town Square on the last Saturday of the month. Follow the scent of smoke to find Iain Spink, who cooks smokies before your eyes. Then, onwards to Dysart, a fascinating little burgh of red-tiled roofs, a sign of its trading history with Holland. After the two Wemys villages with their ancient caves and 14th-century castle comes the more industrial Methil and Leven. From Leven the beach continues past the pretty villages of Lundin Links and Lower Largo and ends at Shell Bay. From here you can often see boats fishing for razor clams, though sadly these are only rarely seen in local fish shops. From Shell Bay, join the Chain Walk. This series of chains and steps cut into cliffs allows access at high tides and affords spectacular views where the Forth opens out to the wide North Sea. At the end of the Chain Walk, the village of Elie is the first of the East Neuk coastal villages that dot all the way round to Crail. The Michelin-starred Sangster’s is in the main street while the Ship Inn hosts cricket matches on the beach in the summer. About a mile past Elie, follow a sign at the old rail bridge to Ardross Farm Shop where you can pick up a picnic, or steaks and sausages for a beach barbecue. St Monans, a fishing village with a restored windmill that used to pump seawater to the salt pans, is home to the famous Seafood Restaurant. The pretty coastline here offers views of the Isle of May bird sanctuary and the Bass Rock with its gannet colony. Pass through Pittenweem, which has the only working fish market left in the area and a lovely wee chocolate shop. A diversion inland up the hill brings you to the St Andrews Farmhouse Cheese Company where on certain days you can watch Jane Stewart make her Anster cheese. Along this stretch of coast you may come across the Scottish Wildlife Trust’s ‘Flying Flock’, a flock of blackface sheep grazed about the region to keep the grass down. The SWT sells the meat from these animals from time to time: worth looking out for. Anstruther is the largest of the fishing towns in the East Neuk. It’s home to The Cellar, a lovely seafood restaurant run by Peter Jukes for the last 30 years, and the famous Anstruther Fish Bar. At Crail there is the tiny Lobster Store and Penman’s, an excellent butcher. Once around the headland, you’re walking northwest towards St Andrews. Here there are plenty of restaurants, cafés and food shops – for a fine picnic on the West Sands try places such as IJ Mellis on South Street, The Little Italian Shop in Bell Street, and bakers Fisher & Donaldson on Church Street. Head out of St Andrews and cross the River Eden at Guardbridge, as pilgrims have done since the 13th century, and through the small town of Leuchars to Tentsmuir Forest where you’ll find an old ice store that housed salmon in the days when they were netted in the Tay Estuary. It’s worth knowing that Fife Ranger Service offers fungi forays, a great way to find ceps, chanterelles and many other mushrooms. For one of the finest seafood feasts in Fife, stop at the tiny wooden shack by the harbour in Crail known as the Lobster Store. Run by the Reilly family for several decades, it sells fresh, seasonal lobster and crab from local waters. Choose your live lobster and, while it’s being cooked, enjoy a dressed crab packed with meat. The Lobster Store supplies mayo and Tabasco but bring your own fork if you want to picnic on one of the tables around the pier. Your view? One of the prettiest harbours in the East Neuk, with sea gulls circling and lobster and prawn boats chugging in and out of the bay. 34 Shoregate, Crail, 01333 450476 is open Sat & Sun noon–4.30pm between Easter and September, as well as weekdays (same times; closed Mon) in July and August.